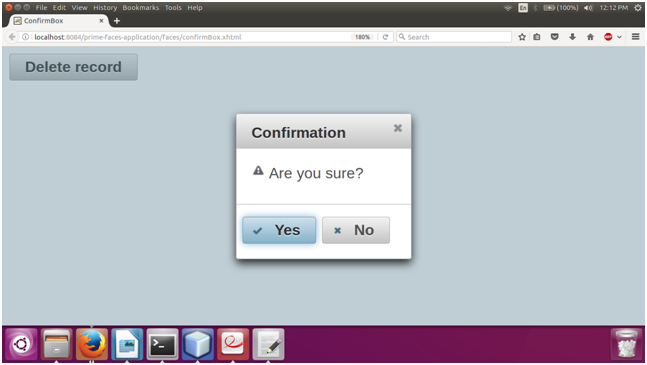 The <p:confirm> component is used to create a confirm dialog box in JSF application. It has various attributes that are tabled below. message null String It is used to set text to be displayed in body. header null String It is used to set text for the header. severity null String It is used to set message severity for the displayed icon. width auto Integer It is used to set width of the dialog in pixels. height auto Integer It is used to set width of the dialog in pixels. style null String It is used to set inline CSS of the dialog container. closable true Boolean It is used to define if close icon should be displayed or not. 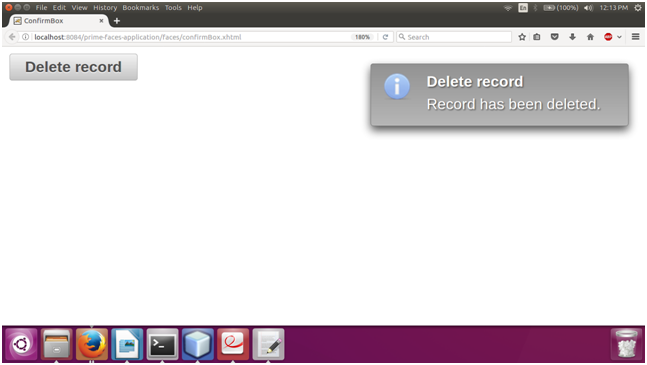 appendTo null String It is used to append the dialog to the element defined by the given search expression. visible false Boolean Whether to display confirm dialog on load. global false Boolean When enabled, confirmDialog becomes a shared for other components that require confirmation. responsive false Boolean In responsive mode, dialog adjusts itself based on screen width. Here, in the following example, we are implementing <p:confirmDialog> component. This example contains the following files.